This topic has 2 voices, contains 9 replies, and was last updated by chrisoosting 108 days ago. I have a problem with the customer checkout button, it is not showing. Customers can check in but don’t check out, how can i fix this. Can you please provide some more information? For the moment we are not able to fully understand your request. If appropriate, you can attach some screenshots to better illustrate, what exactly you mean. My fault, it must me customers can log in to their account but can not log out, logout is not showing. And another thing, after the tb upgrade live search is not showing al the pictures of products, do i have to delete a cache file for that? 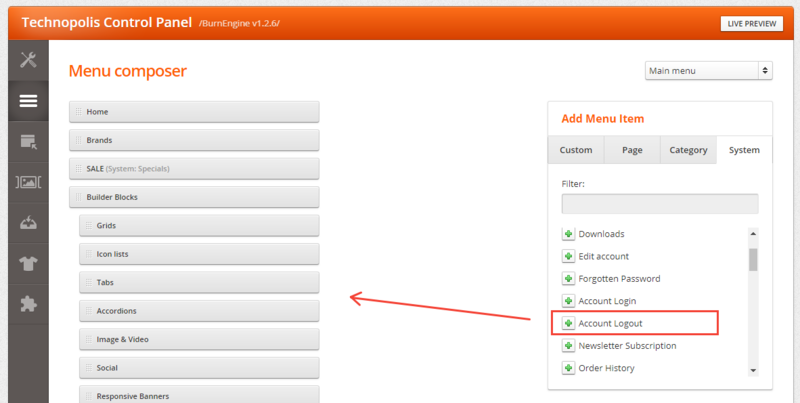 You can add a logout menu link from the Menu composer. The link will only be visible when you are logged. The link for the logout menu is installed, but not showing at the frontend when a customer is logged in, that is the problem. see screenshot. Logout is stil not working, and live search not showing al the pictures. Have you revoked the latest admin access you gave us? admin access was inactive, is active again. Hope you can fix this for me, also the pictures in the live search. The problem with the login/logout menu was a missing closing tag in your analytics code. We’ve added it and now everything works fine. And why are not al the product pictures showing in the search bar, did you also look at that. It still only shows some pictures.